What's really thrilled me is the sheer number of comments generated by those images. It is fascinating to watch this argument develop. 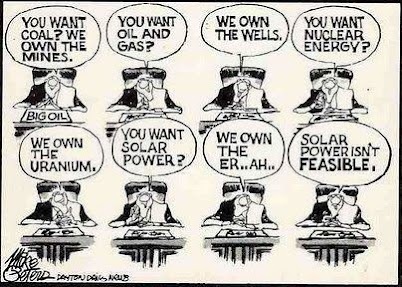 It does often seem to be between renewables and nuclear, I can find no examples of people defending coal, 'natural' gas or oil as fuel sources for generating electricity. I guess corporations running those very common institutions are just keeping their heads down. The argument which is slowly coming to maturity is around micro generation and smart grids. All the talk of solar PV not being enough, we need big nuclear central energy generation as a base is becoming increasingly questionable the more I find out about it. If, as in Germany, nearly every house with a suitable roof was fitted with panels, if every business (B&Q in Germany is a good example) used their roof space to mount panels, and all those millions of panels fed into a smart grid that could deal with the various flows and rates of power, our reliance on big, industrial generation plants would diminish enormously. In the UK if every old mill site (there are around 3,800 in England) had a micro turbine installed, buried, no one would see them, they would generate enough electricity for several million homes. If every farmer has a 15 kW wind turbine, (they are not that big) and every massive ugly landscape despoiling electricity pylon (we're used to them so we don't write to the Daily Mail about them) was fitted with an internal wind turbine our dependence on imported, increasingly expensive and finite fuel sources would diminish dramatically. All these things require a fairly enormous upgrade to our national grid, but that is a lot cheaper that building more coal burners, more 'natural gas' burners and massive new nuclear facilities with all the problems those systems carry with them. I'm not now and have never been opposed to nuclear power, I'd happily have a nuclear power station in my back garden, modern iterations of the technology are safe, clean and reliable. However I wouldn't want a nuclear waste fuel storage facility in my back garden, or near my back garden, or near my country, or even on the planet I inhabit. This problem is real, it's concrete quite literally, it's incredibly expensive, the power companies don't pay for it, we do though our taxes and we will continue to pay for it for many 100's of years. No one has solved this problem there is talk of solutions but they are way off, expensive, complex and risky. To say 'solar panel manufacture requires dangerous chemicals' is heart breakingly tragic and blinkered. If you gathered all the toxic waste from every solar panel factory on earth in one place and stored it next to a kindergarten the risk management would be well within our technical abilities. If we gathered together all the nuclear waste from every power plant on earth and stored it anywhere we'd be in big trouble. I'm very excited to report that I will soon be conducting an interview with chief technicians at the National Grid Headquarters near Reading to discuss the development of the smart grid in the UK. EDIT I have quite rightly been castigated for not linking back to where the pictures came from. My excuse is that I collect so much stuff I forget the source. Not good enough I know. I was sent the correct links by @MikeTonge on the Twitters and I thanks him for his efforts. I will do better in future.